Another quick and easy little card. This measures a bit less than 4×4” I think. It is the largest of the Label 1 Nestabilities dies. Instead of cutting a full layer of the stripes and then cutting it to size, I marked the die with permanent marker and lined up my paper cutting only the piece I needed. Saves paper, right?! I used Eclipse tape to hold the die and paper to my Cuttlebug plates so they wouldn’t shift. For beginners info, Eclipse tape is basically a roll of paper with repositionable adhesive used for masking; it comes in several widths. That way you don’t have to use repositionable adhesive or press normal tape to your pants or carpet to get fuzz stuck to it reducing it’s stickiness. The problem with repositionable tape is that it can transfer from the surface you adhere it to and get on your final work. I was making a one-layered card with lots of masking; I added repositionable adhesive to the mask. As I brayered over my mask, the adhesive transferred to my card. I tried to remove it but I couldn’t find my adhesive eraser and so the card ended up in the round file 😦 I haven’t tried Eclipse tape for this but I hear it works. Normal tape isn’t too bad for holding paper and a die in the Cuttlebug but if you misjudge how much fuzz you need, your tape can be too sticky and can tear your paper. And of course, it simply doesn’t work for masking. Eclipse tape does both!! 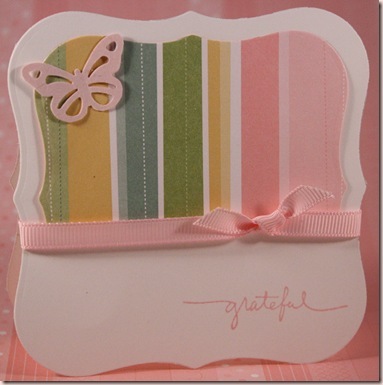 For a tutorial teaching you how I made the shaped card, Click HERE. Accessories: pretty in pink ribbon, MS butterfly punch. All products by SU! unless otherwise noted. Great tips – thanks for sharing your insights because I have had the same trouble! Love the simple and clean look of this card – it’s wonderful! Pretty card! I love the colors in the striped paper. i just bought this set of Nesties and I’ll have to try this out!